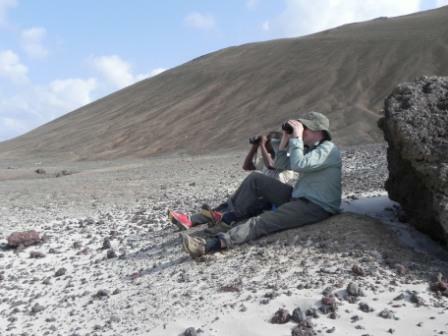 During 2-10 March 2013 our team made observations of the migration of raptors at Ras Siyyan. Ras Siyyan is a volcanic cone in Djibouti, and is the piece of Africa closest to Arabia. Ras Siyyan and Pirim Island form the Bab el Mandeb Straits, which are a significant bottleneck for soaring birds migrating along the Rift Valley flyway, the second most important flyway in the world. We counted a total of 4562 migrating raptors. Many of those could not be identified because they were too far away. Of the identifiable raptors (3290), over 53% were booted eagles (Aquila penata/Heiraatus pennatus) over 35% were Egyptian vultures (Neophron percnopterus). Egyptian vulture is an endangered species, whose population has declined in recent decades due to a range of causes including accidental and targeted poisoning, persecution, electrocution and disturbance. Unfortunately, its decline and the reasons for it are mirrored in other vulture species throughout much of Europe, Asian and Africa. Apart from the migration being dominated by the two species, it was also interesting that we saw no (zero) Egyptian vultures that were < 3 yrs of age. This observation supports the theory that immature Egyptian vultures that eventually breed in Europe and Asia, spend their immature years in Africa. Almost all our observations of migrating birds were made in the morning before 1100. Typically, migrants would start moving at about 0800, but by 1000 soaring groups were disappearing from view both southward and upward. We spend some afternoons trying to locate the migration, and only did so on the last day, when we found a stream of eagles flying southward above coastal hills about 20 km south of Ras Siyyan. Despite our efforts we never did locate a point of embarkation and we suspect that the raptors just gained height and perhaps crossed along a relatively broad front toward Yemen. 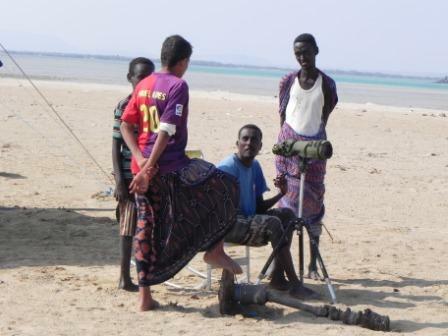 Ahmed Hamadou, our local guide, talking to local fishermen who could not go to sea due to the heavy winds.